Lets just get the confession out of the way. My name is Amanda and I am whole heartedly addicted to chips and salsa. I could eat chips and salsa every day for the rest of my life and not have enough. 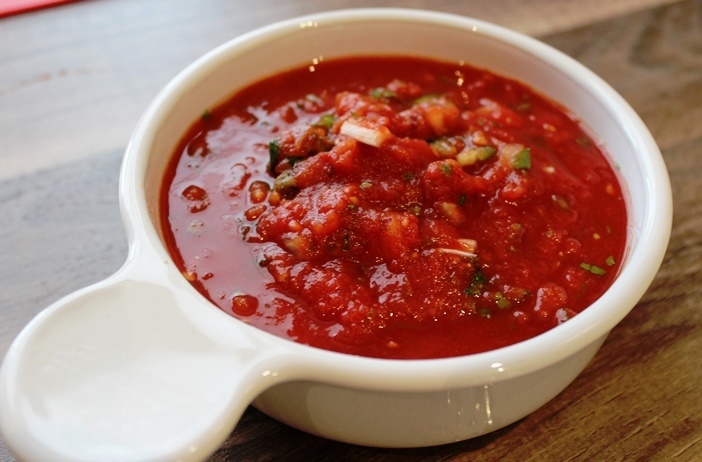 This addiction also makes me a bit of a snob when it comes to salsa…while I am admitting things I might as well admit that as well! A year and a half ago, I moved to Germany. And to the best of my knowledge there are exactly two brands of salsa available in the grocery store. One tastes like something so ungodly disgusting that I threw it away after one bite. The other brand is not so spectacular either, unless you want a salsa that has a base of something that tastes like barbeque sauce with a few bell pepper pieces thrown in the mix. Gross, gross, gross. 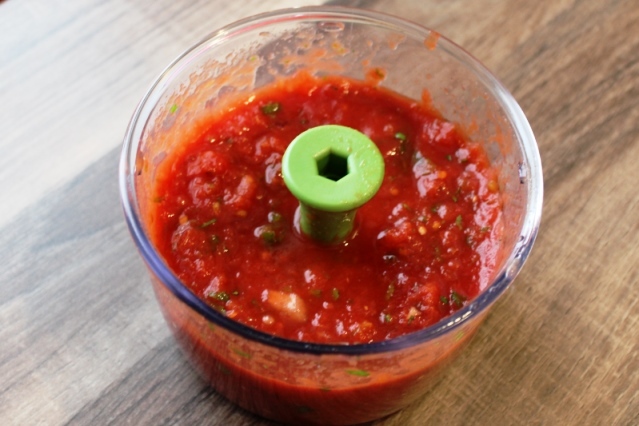 At the end of last summer, I hosted a salsa making party where we canned salsa. It was good. Real good. It was real salsa. We ran through of the first few jars right away, and I have been hoarding the last one since January. 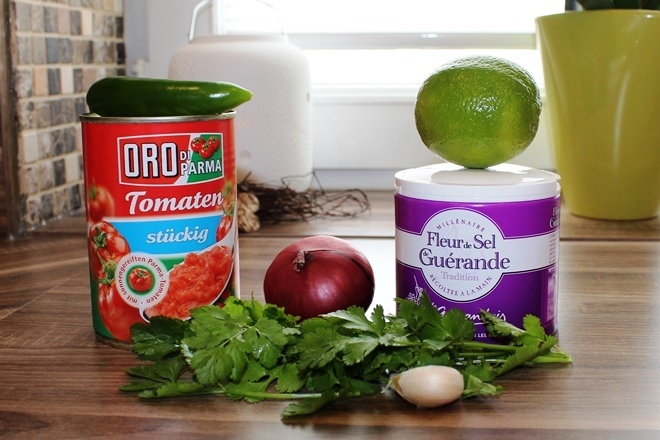 That recipe will follow at the end of summer, when our second annual expat salsa party happens. Stay tuned! To start, chop up the onion, cilantro and jalapeno pepper. For the onion, small diced sized pieces are best. 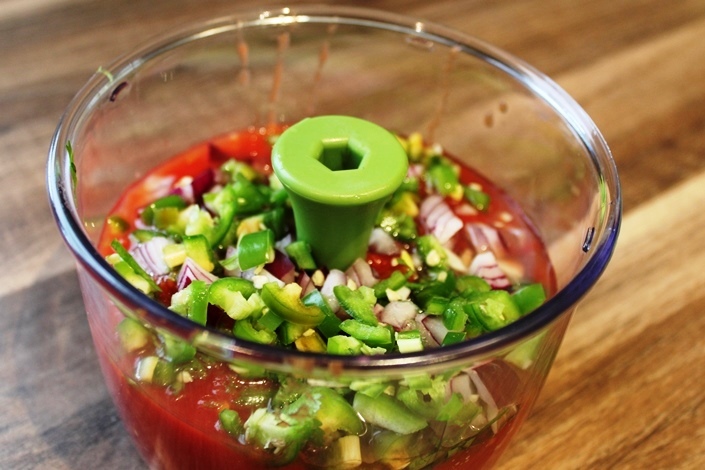 For the jalapeno, you will cut it in quarters and then thin slices. I like to cut up my cilantro in very small pieces. Then, open up the can of tomatoes and pour it into your chopper or bowl. 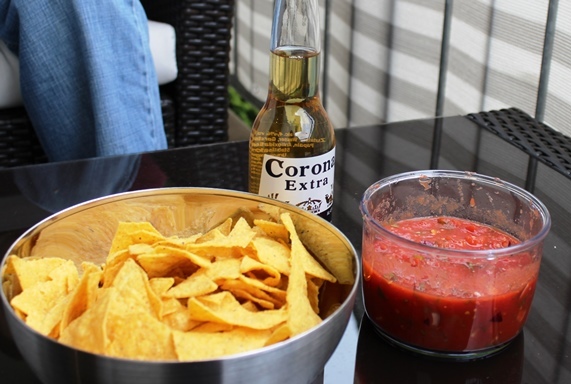 One big difference here between the US and Germany – diced or ‘stuckig’ tomatoes here are less dicey and more saucy which makes them a perfect salsa consistency according to my expert opinion. Next, crush the garlic with a garlic press into the tomatoes. Then, zest the lime and add this to the tomatoes. Now, add your jalapeno, onion and cilantro to the mix. Then, just a pinch of salt. I used a French Sea Salt called “Fleur de Sel” which I have recently fallen in love with but regular salt would be just fine too! Last but certainly not least, add the juice from half the lime…it really ties the room together. Now, for the best part. Serve this up with chips…and a Corona. Then dream you are sitting on a beach in Mexico, enjoying this tasty treat instead of sitting on your own balcony in a sweatshirt. It’s not that far off…really! I enjoyed this more the second time around, so chilling it in the fridge for awhile doesn’t hurt if you happen to be in possession of patience unlike me! Combine all ingredients in a small hand chopper, blender or bowl. Chop to your personally preferred consistency. Chill for an hour (if you can wait!) and then serve with your favorite tortilla chips (Corona is optional, though highly recommended).